Got my in-progress space station setup for Infinity games out on the table today, as one of two tables set up for a very small (four players!) 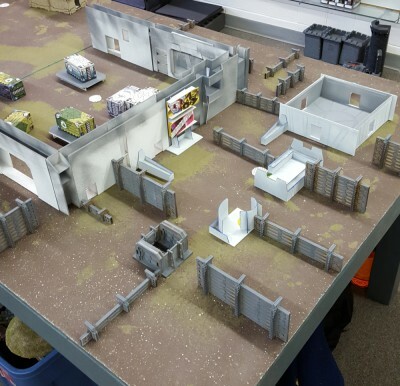 local Infinity tournament. Space station setup first outing at Everything Games. Click for larger. Space station setup from a different corner. Click for larger. It was well received and the other folks had some good ideas for finishing it – breaking up the line of sight down the access tunnels and making it clearer where the ladders are, for example, as well as an idea for a smaller module to offset some of the lines and make it less strongly linear, which I might incorporate. 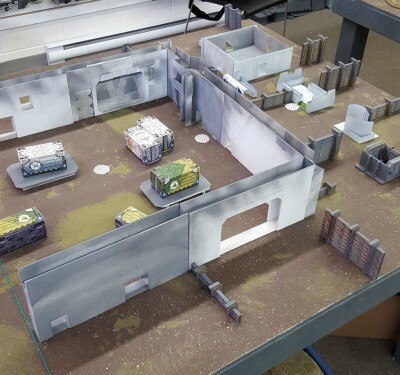 I’ve got some grey felt that I’m probably going to cut a 4’x4′ mat out of, and I want to do a whole lot more painting and surface detailing of the big hangar wall modules. Need to get more grey spraypaint first, as my current can ran dry while I was putting a base coat on these pieces last night!